ROSCOE VILLAGE — Eric Strand hopes his posters crammed with street names from college towns across the country elicit memories from various students and alumni. 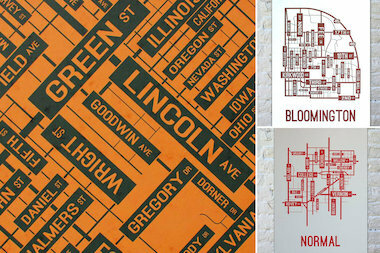 Strand recently founded School Street Posters — which now carries 21 colorful maps of big-name university locales like Champaign-Urbana, East Lansing, Mich., and Bloomington, Ind. — out of his Roscoe Village home. He's selling about 20 posters, which retail for $22, per day and plans to release a Norman, Okla., poster on Tuesday. He will debut a new poster every week next year, said Strand, 31. "When I started the website, I honestly did not know if people would like the concept," Strand said. "But over the last few months I have received a lot of supportive emails from people that either love the print they bought or from people asking when I am going to create a poster of their college town." Roscoe Village resident Eric Strand is the founder of School Street Posters. The company is named after School Street, where, in 2003, Strand met his wife, Janis, in Downstate Normal, when he was a student at Illinois State University. Janis, a neonatal intensive care nurse at Rush University Medical Center, helps Strand pack and ship orders while the couple raise their 4-month-old son, Dean. Strand, a native of suburban Geneva who has bachelor's and master's degrees from ISU, has lived in Chicago for seven years. 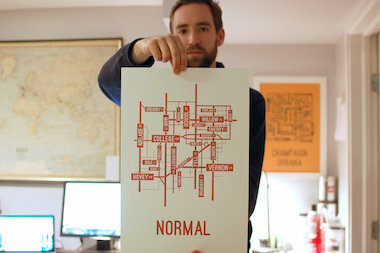 His first poster was of Normal, and it's been hanging in his house since its creation in 2012. He then made posters for Champaign-Urbana, Bloomington, Ind., and Ann Arbor, Mich., before building a website in September. The site went live on Oct. 1, with sales starting at about 10 per day before "taking off" recently, he said. "It's made me feel confident that there is a market for the product," Strand said. "My customers are primarily alumni, as well as some students. "College towns are interesting places," he added. "I think people tend to think of them as small and simple — especially if you live in a big city like Chicago — but they are teeming with life, wildly diverse and intellectually stimulating." The posters are 13-by-19 inches and printed on cover stock poster paper, said Strand, adding that he creates both digital and screen prints. The latter are made using a mesh silk screen with Strand taking a squeegee to hand pull ink through the silk screen to produce each poster. He said the effort has been worth it. "I think people feel a connection with the prints because the posters remind them of the many different experiences they had while they were away at college," he said.